The headless Pi connects to the house WLAN through its built-in WiFi link, so I can run the whole mess from the Comfy Chair at my desk through Remmina / VNC. 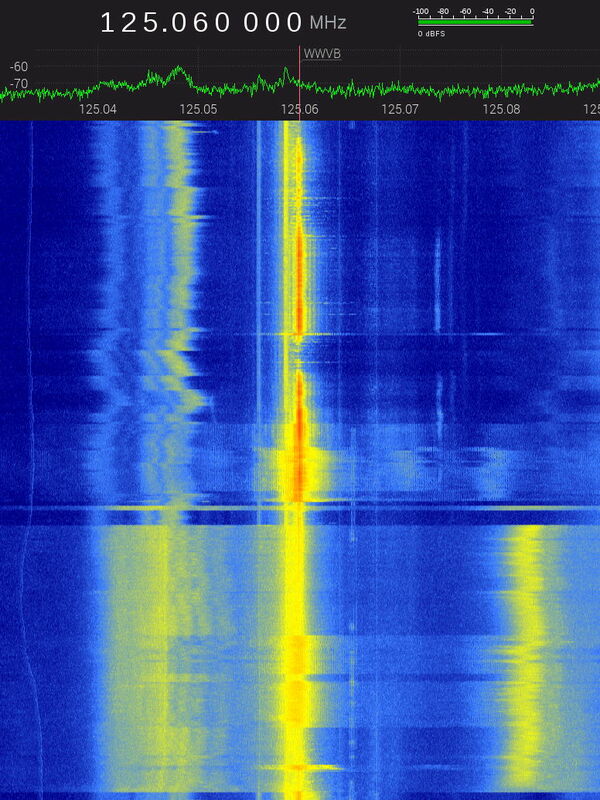 The wavy line along the left edge looks like a birdie formed by a local oscillator in the attic, because the frequency varies (inversely) with temperature. 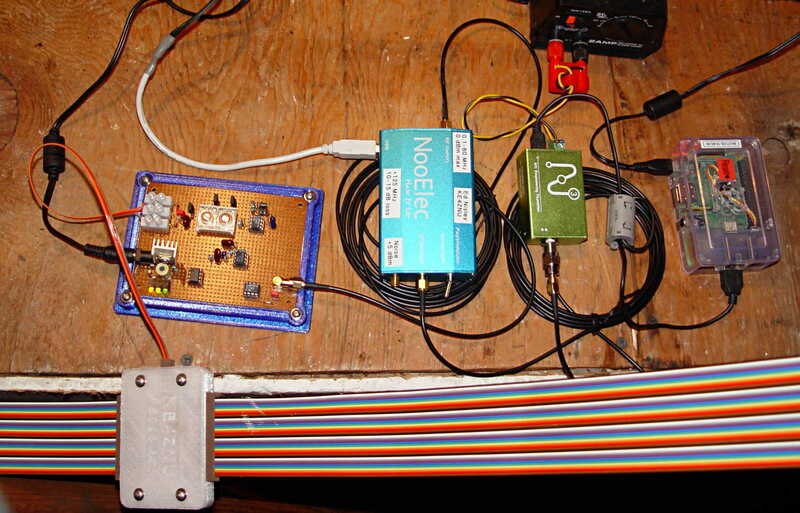 It’s probably a signal on the Pi board, rectified by some junction, and translated in-band by some Ham-It-Up harmonic. Whatever. The other traces come out bar-straight, suggesting that the 0.5 ppm (presumably, per °C) temperature-compensated oscillators along the whole RF chain behave as they should. There’s a slight frequency shift, on the order of a few parts-per-million, between the absolutely accurate WWVB carrier and the indicated display. Not a big deal. The broad, albeit irregular, orange band down the middle shows the loop antenna / preamp bandwidth, which is on the order of 2 kHz at -3 dB and a few kilohertz more down to the noise level. The broad horizontal gashes seem to come from the N3’s on-board hardware AGC reacting to signals far outside the waterfall. 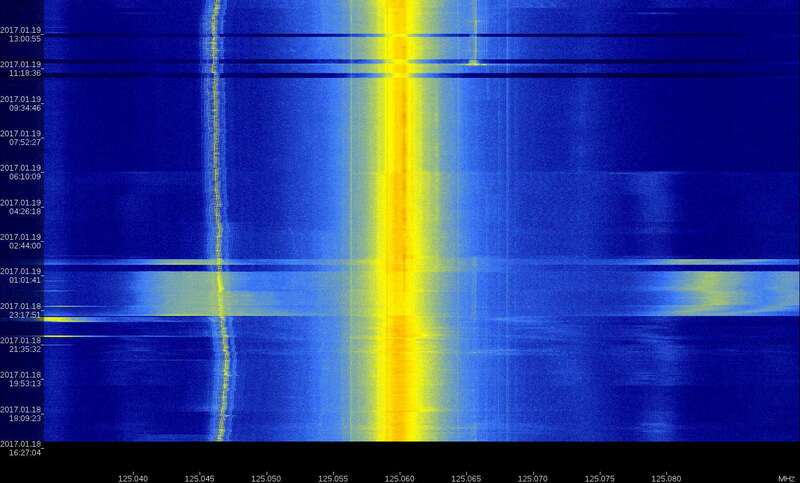 Various birdies appear & disappear, even in this limited view, so you can just imagine what’s happening off-screen; anything popping up within the SDR’s tuning range clobbers the gain, which becomes painfully visible when zoomed this far in along both frequency and amplitude. Turning AGC off should stabilize things; perhaps software can tweak the SDR gain based on a very narrowband filter around 60.000 kHz. The upper half of the waterfall shows decent reception for most of the night. The bottom half shows there’s basically nothing goin’ down during the day, which is about what I’d expect based watching the Alpha Geek Clock for seven years. Various sources still clobber the receiver response, but it’s not quite so dramatic.